I made this bread one Friday afternoon in lieu of challah. The Pain De Campagne recipe (pdf) came with my weekly CSA email the second time we got oregano. The first time we got it I dried my bunch, so this time I decided to use it all up in bread, as suggested. For those of you who are scared of making bread (because it can be intimidating), don’t be! 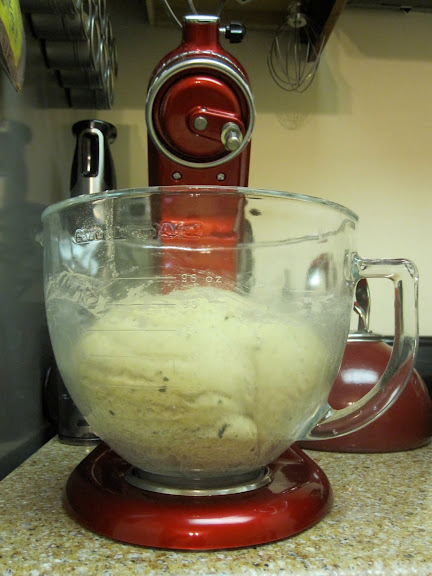 this is very easy, especially if you have a stand mixer with a dough hook attachment! You just have to be patient. The dough will double in size after a couple of hours. Then you have to shape it, and wait another hour for the dough to rise again. Then bake. And that’s it! See; making bread is easy! I did make a few changes to the original recipe: I used dry yeast instead of fresh, I shaped the dough into two smaller loaves, since we were just two people, and froze one for later, I used Earth Balance instead of butter, since I was serving it with a meat Shabbat dinner, I used all purpose flour, since I couldn’t find bread flour, and just kneaded it a but longer and I cut a different design into the top. Mix 1 cup of the water with the yeast and let sit for 4 minutes. Place everything except for the water and the yeast into the bowl bowl of your stand mixture fitted with the dough hook. Slowly add the water/yeast mixture to the bowl and mix on low until everything has been incorporated. Add the additional 1/4 cup of water. Increase speed to medium and let mix for 10 minutes. Let stand for 2 hours. 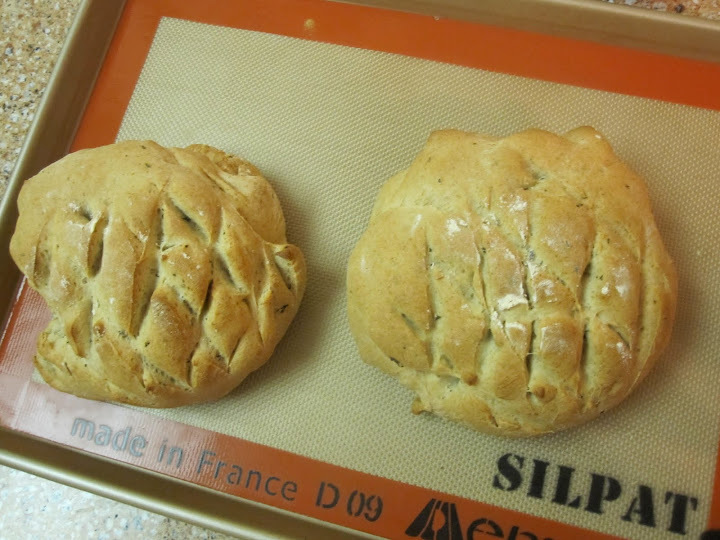 Meanwhile, prepare a baking sheet with a silicone mat or parchment paper. Turn the dough out onto a lightly floured counter, split in half and shape each half into a ball. Dust your hands with flour and lightly flatten each loaf. Use a knife to carve a shallow design on the dough, put the loaves on your prepared baking sheet and let them rise for 1 more hour. Preheat the oven to 425 degrees and bake for 20-30 minutes, or until the loaves are a golden-brown color. Let cool on a wire rack. This entry was posted in Uncategorized and tagged csa, oregano, to export. Bookmark the permalink.